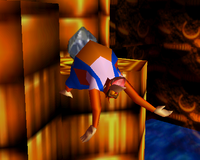 Baboon Balloon (Baboonus Balloonus) is Lanky Kong's special pad ability in Donkey Kong 64. Lanky learns this ability after buying the potion from Cranky Kong at his lab in Frantic Factory for seven Banana Bunch Coins. When Lanky Kong stands on a Lanky Pad, pressing causes him to inflate himself like a balloon. He slowly floats upwards, but this is only temporary as he eventually deflates and returns to normal. The player can use the control stick to change the direction Lanky floats in. He bounces off surfaces while inflated. The player can press again to prematurely deflate Lanky. This page was last edited on January 2, 2019, at 00:46.